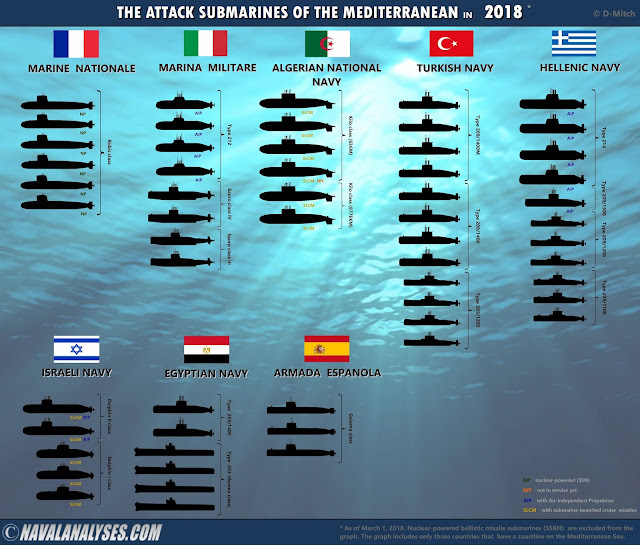 In the following infographic, named The Attack Submarines of the Mediterranean in 2018, I depict all the attack submarines that are in active service in the Mediterranean Sea right now (and will continue to be part of their Navies until the end of 2018). Please note that in comparison with the previous graphs about The Attack Submarines of Europe in 2017 (updated for 2018) and The Attack Submarines of Latin America in 2018, there are nuclear-powered submarines (SSN) in the region, and specifically only France has that type in its inventory. There are also navies that have submarine-launched cruise missile capability which belong to Algeria (Kilo class with Club-S) and Israel (Dolphin I/II class with Popeye Turbo). Moreover, there are three countries in the region with submarines in their inventories equipped with Air-Independent Propulsion (AIP) system; Greece (five in its inventory), Italy (four in its inventory) and Israel (two in active service, one more to be commissioned). It should be mentioned also that from the 21 the countries with coastlines on the Mediterranean Sea, only seven navies (7) have submarines in their fleet. 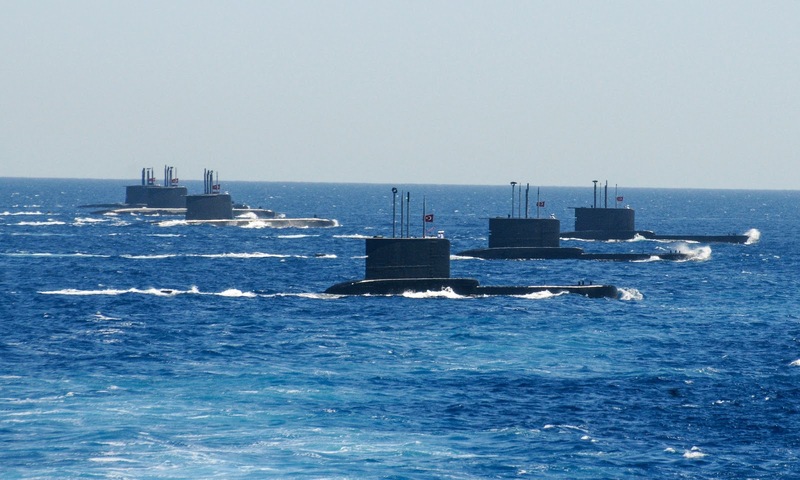 Specifically, Turkey has the most numerous fleet but France has all its submarines nuclear-powered while Greece has five (5) of its eleven (11) submarines (only one boat less than Turkey) equipped with AIP. Furthermore, Egypt, has in its inventory the longest submarines in the region (Romeo class: 76.6 meters length) and the oldest as well and Algeria the largest ones (Kilo class: approximately 3,200 tons submerged). The Attack Submarines of the Mediterranean in 2018. For a high resolution image click here. Since when is Russia a Mediterranean country? Well, at least since they opened that base in Syria; which they are greatly expanding with a new long-term lease. I think it's called Latakia, just north of the Lebanon border and right in the heart of Assad's tribal territory. According to defencepoint.gr a most interesting thing about the six Turkish submarines of the Reis class is that they will be covered with special RAM material that reduces the ship's electromagnetic trace developed by the Turkish STM company. This material has already been tested in a Turkish submarine class Gur (Type 209/1400) which participated in a NATO naval exercise with absolute success. The submarine managed to reach an Italian submarine Type 212A within 500 meters without the latter realizing the existence of the Turkish, resulting in the virtual submarine immersion of the Italian submarine.